When I take the kids to the mall, we smell it right away. That smell of butter wafts through the indoor air, as well as the bread-like baking odor. And it's a little sweet, too. As we get closer my kids see the stand. "Mom, can we get Auntie Anne's pretzels?" And, of course, I cave. Because I love them, too! 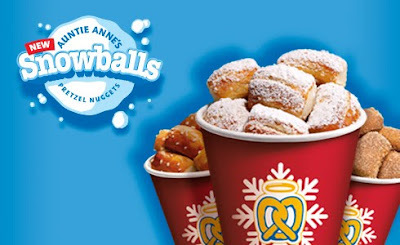 And here's some good news - just for the holidays, Auntie Anne's is offering their Pretzel Nuggets Snowballs! These delicious nuggets are made by adding powdered sugar to their original nuggets to create the perfect salty and sweet combination. Auntie Anne's sent me a free coupon for Snowballs, so that I could review them here at Frugal Follies. So, golly gee, I just had to go get some and try them. What a tough life I live, don't you think? The cup I received had 18 hot pretzel nuggets in a 9-ounce plastic cup, covered in butter and powdered sugar. One bite and - mmmm! - they were delicious. Maybe just a little on the too-sweet side. But my kids would say that there's no such thing as too sweet. I was tempted to eat them all right there, but I resisted. When I got home, I took them out of the cup. I have to say, the ones at the bottom weren't quite as beautiful as the ones on top - they were packed in. But, on the good side, I guess that means that I got more in the cup! This would be a great snack to have while finishing up your holiday shopping. (You mean you haven't finished yet?) Just be sure to get lots of napkins to wipe up the remains of the the sugary, buttery topping - or to wipe your hands after you've licked the topping off your fingers! Would you like to try Auntie Anne's Snowballs? You probably already know the locations in your area, but if not, check here. 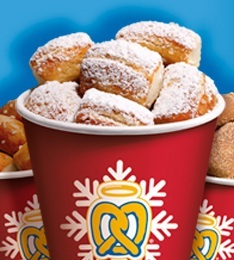 Frugal Follies is hosting a giveaway for 3 Auntie Anne's free Snowballs coupons! Five winners will be chosen, for a total of 15 coupons being given away. Here's the fine print from the coupon: "One coupon per person, one-time use only. Not good with any other offer. Available at participating locations only. Not a cash substitute. Not for resale. Duplicated or altered coupons will not be accepted. Coupon expires Jan. 6, 2013." To enter the giveaway, use the Rafflecopter below! The giveaway is open to US residents 18 and older and ends on Wednesday, December 26, 2012, at 11:59 pm ET. 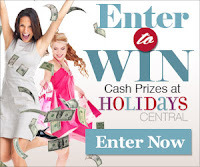 If you are one of the winners, I will contact you via email. If you do not respond within 48 hours, another winner will be chosen. This promotion is in no way sponsored, endorsed or administered by, or associated with, Facebook. I looove the cinnamon sugar flavor! Sour cream & onion - although I love original & cinnamon sugar and the snowballs look delicious! I love their cinnamon sugar pretzels! I would like to try Auntie Anne's Almond Pretzel. I love the Original! Thanks! My very favorite flavor is Cinnamon Sugar! I'm a cinnamon sugar girl as well! The jalapeno or the garlic with some cheese sounds good but the cinnamon and sugar with some frosting would be good for a dessert. Thank you for the giveaway. the sour cream and onion yumm!!! I love the garlic and the sour cream and onion. I like the cinnamon sugar flavor. I like the cinnamon sugar. Almond! I've had the Cinnamon sugar and they are gross to me, but my kids really really love them. I love cinnamon sugar pretzels! Cinnamon Sugar is my favorite! I would love to try the cinnamon sugar pretzel. I have to go with the classic- cinnamon sugar. Definately cinnamon sugar. Yum !! Pepperoni sounds very good to me! I like the original with salt the best but they are all good. Cinnamon sugar and raisin, though they all look great!! The Cinnamon Sugar is to die for, so good! The cinnamon sugar pretzel sticks look the yummiest!! The cinnamon and sugar is my favorite. I like their jalapeno variety. Thanks for the chance. I love their original pretzels. I like the CINNAMON SUGAR PRETZEL! The almond pretzel looks delicious! I like the salted original. I like the original pretzel. I loooove the garlic pretzels! Oops, forgot to leave my e-mail with my comment...it's walindeman at gmail dot com, and rafflecopter name is Whitney Lindeman. Original is my favorite and sounds best. Original with plenty of salt! Cinnamon sugar would be great! I love the cinnamon sugar flavor with cream cheese. I like the original with butter and salt!!! Cinnamon and Sugar of course. We love the pretzel dogs! Sour Cream & Onion sounds good. Cinnamon sugar is a must! I think the Almond sounds really good. I'd love to try the sour cream and onion pretzel. I love the garlic pretzels! Sour cream and onion is my favorite! These look great too! I love the jalapeno pretzel. I like the Sour Cream and Onion. The Pepperoni flavor looks delicious! All those Pepperonis! I love the cinnamon ones!